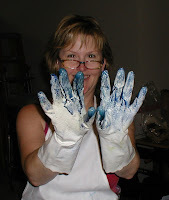 It’s hard to believe that it has been two weeks since I have posted, but when I look back to all that I have done…..
After my fun day of dyeing fabric, I invited several friends over for a Party to Dye For. Here are some of the pictures. We had such a great time sharing and learning from each other. I manned the Parfait Dyeing table while Kathy taught us Soy Wax Resist and Screen Printing. Michelle brought natural dyes, Tumeric, Marjoram and I provided Avocado. Many Thanks to Diana for taking pictures for us! Most of the fabric that I dyed is now in my StudioJules ArtFire Studio. There are Fat Quarters, Half Yards and Full Yards of fabric. The colors that came out in the dye are wonderful and variegated. Some of the pieces are subtle, some are striking. Take a look, be enticed! I just have the outside boarder left to quilt on the Traditional Batik quilt that I started quilting a few weeks ago. I’m hoping to work on it this weekend and finish the first of next week. I also got my pumpkin quilt back from being quilted. Just need to put the binding on it and I can hang it in the stairwell gallery. Okay, Jeff will hang it…. The planning and organizing for the Dallas Area Fiber Artist Annual Member Show is taking a lot of time right now. Contacting sponsors for prizes, working with the ArtCentre of Plano and our membership. Luckily most of my pieces are already complete, photographed and ready for submission. Last week I also joined the Textile and Fiber Art List (TAFA). There are wonderful artists on this list! I'm inspired and in awe of what other artists accomplish and blessed to be listed among such wonderful people. Well, that is it for today. I’ll try to be better about posting, but you know how time can just get away from you! I do believe I missed a great time!! Next time I'll have to take a "mental health" day from work b/c isn't that what art is all about! !